have an ugly lamp? 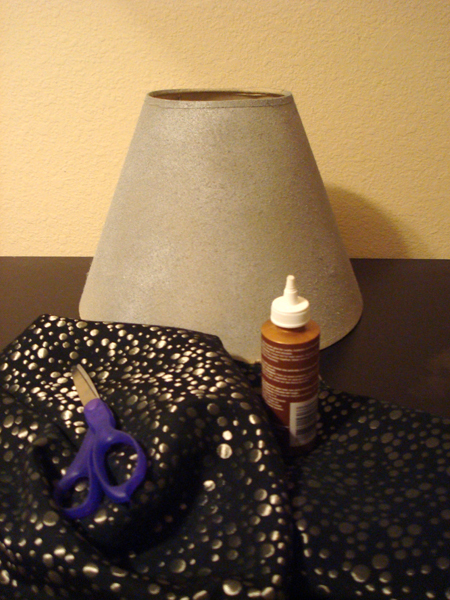 You can revamp a lamp shade in a few easy steps. 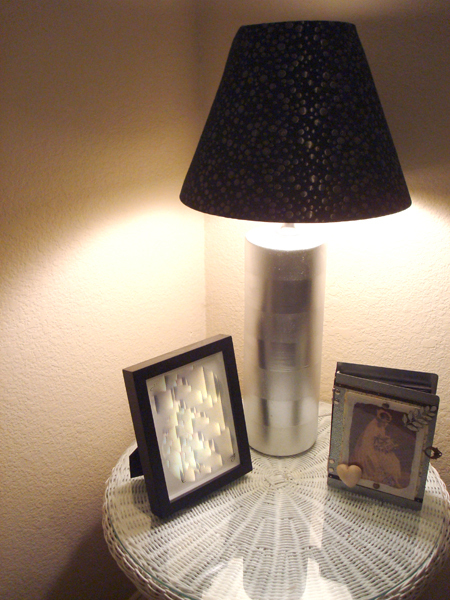 You can take an ugly lamp and make it a nice bedside accessory. You can start out by spray painting your lamp base with a few coats of a color that will match the room in which your ugly lamp currently resides. My lamp was originally some ghastly off-white and cream striped concoction that was literally left behind by a previous owner at my last place. I swiped it because it had a modern base and I knew I could reuse it. 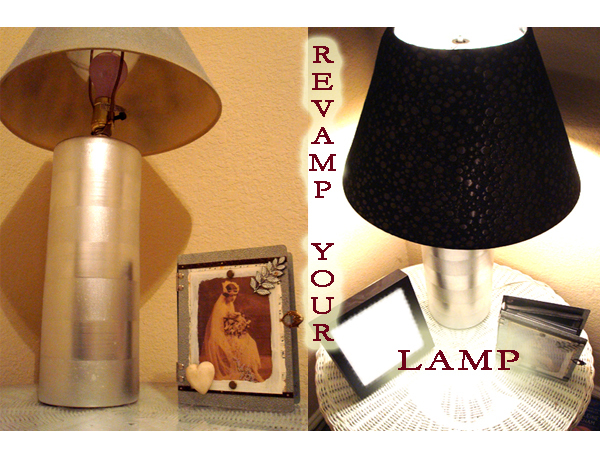 So I chose to paint my lamp metallic silver because it gives it an instant mod update. First things first. This project is going to require some patience so prepare yourself. Start by aligning your lamp shade with one edge of your chosen fabric. 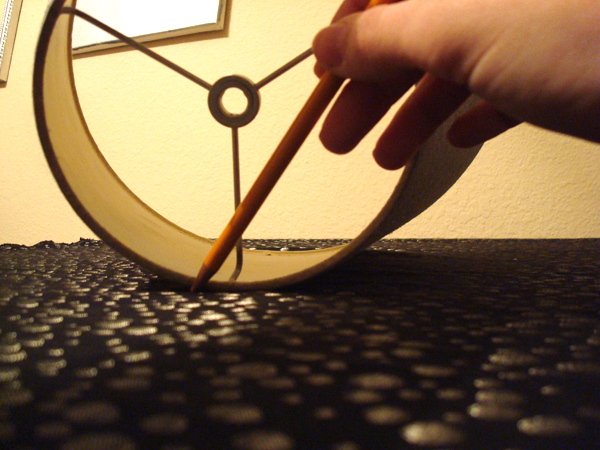 Grab your colored pencil and slowly roll the lamp shade along the fabric while tracing the edge of the shade. If you mess up the first time don’t worry you can erase most fabrics (slowly with a white rubber eraser). When you get a good tracing of one complete revolution of your lamp shade, or at least enough to fit around your lamp shade, go ahead and cut out the inner, smaller arc. 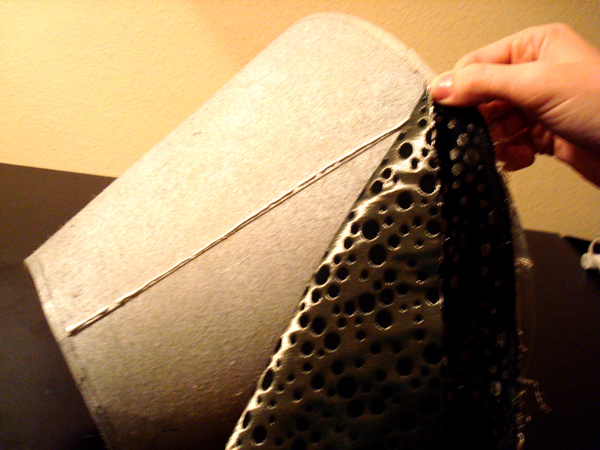 Now, find the lamp shade seam and align the edge of your fabric with the seam (this is the first place you will glue). Move your fabric around a bit before committing to the seam gluing, give yourself a little extra fabric on the side that you cut. Lightly press the piece in place until it begins to stick. 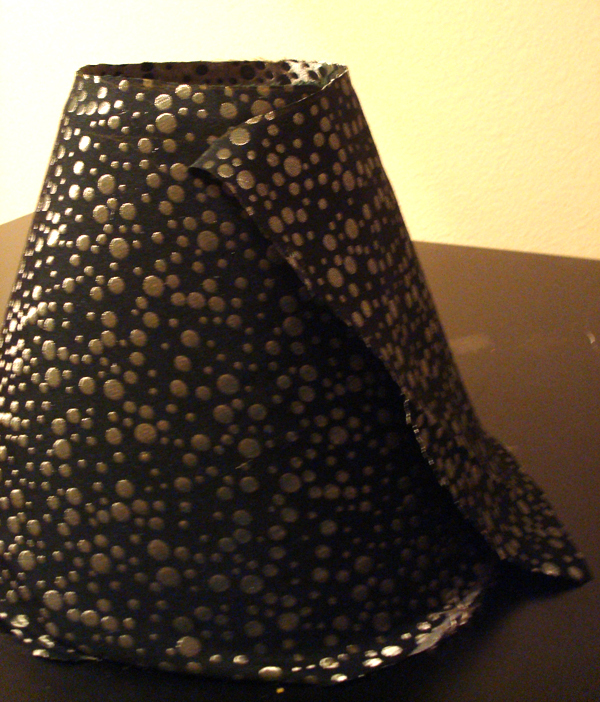 Next, swoop your remaining fabric around your lamp shade and pull it as taunt as possible. This will take a couple of tries to keep in place. You will have to smooth out the fabric while aligning it. When you get it to a taunt smooth point glue your fabric in place at the seam, overlapping the edge that you previously glued. You should have overlapping fabric both at the seam and the top and bottom of the shade. 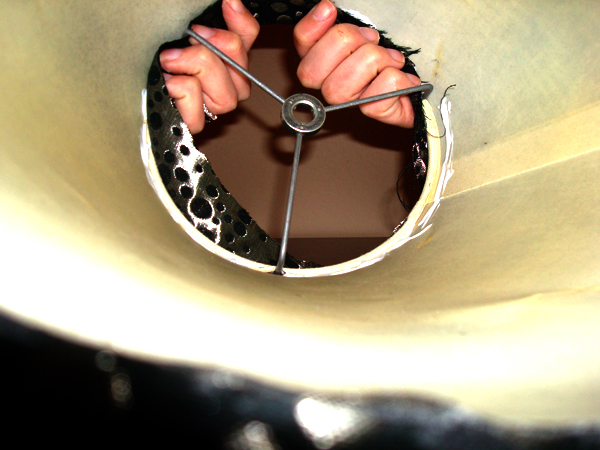 After the seam is glued in place give your fabric a nice clean trim along the seam and glue it in place once more. Next, follow the bottom inside edge with a thin line of glue that you will use to secure your overlapping fabric to the inside of your shade. A handy tool to hold the seam in place while gluing are chip clips or clothes pins. They can provide the pressure you need at a stationary point while you continuously press the overlapping fabric into place with your fingers. It sticks best if you wait until the glue is starting to dry. Don’t worry about uneven edges on the inside they can be trimmed later. When the bottom of the shade starts to dry and seems to stay in place lightly turn over your shade and repeat the last step on the top of your shade. 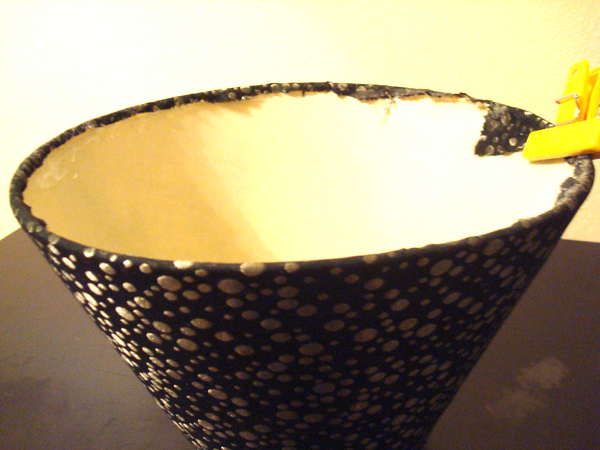 Oh and a handy trick: to clean a lampshade you can use a lint roller!